We look at the method and talk with medical professionals about how to introduce foods to your baby. It's no secret that new parents have a lot on their plate. A method called "baby-led weaning" has been around for years, but it's growing in popularity here in the U.S. It's when parents choose to skip pureed baby foods and instead let the baby feed themselves by eating table food in small pieces. “It made sense to me, you know? Give them real food with real textures instead of a food that is pureed, and shoved in their face,” said Shanna Gustafson. Gustafson has two young children. Jessica Donhauser is a pediatrician at Oishei Children's Hospital. She's seeing an increased number of parents curious about baby-led weaning. “They're the ones doing all of the feeding. You're not spoon feeding them. This way it gets them to try new things and it's also all on their own,” Donhauser said. Studies suggest it helps develop hand-eye coordination, chewing skills, dexterity and healthy eating habits. However, there are some things to keep in mind if you're putting your baby in the driver seat come meal time. First, the baby should be at least six months old. Next, you'll need patience. 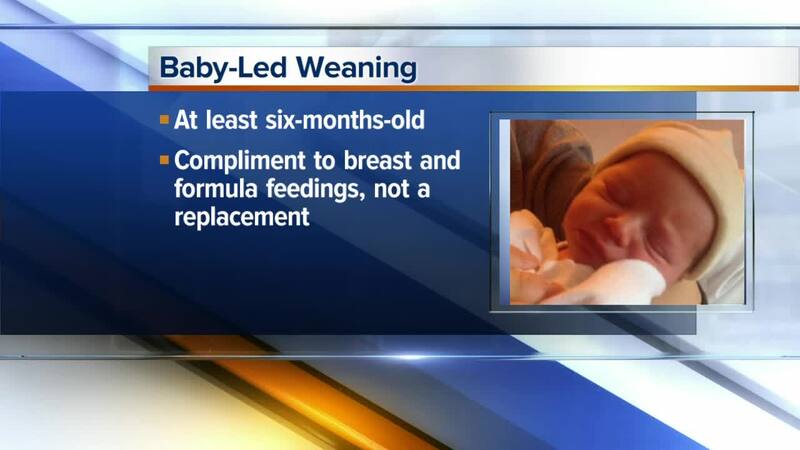 It's a messy and time-consuming process to let your baby feed his or herself. “They should never be left alone during the feeding time,” Donhauser emphasized. Also, some worry there's an increased risk for choking. Donhauser said there's a risk of choking in both baby led weaning and the traditional form of infant feeding. So, choosing age appropriate foods is recommended. “No popcorn, seeds, nothing difficult for a six-month-old to mash up."